What impact does your childhood have on your health as an adult? For those who experienced abuse or neglect, trauma can push their brain’s fight-or-flight response into overdrive, leading to both mental and physical illnesses in adulthood. 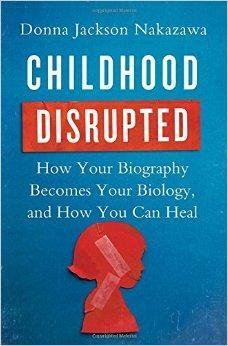 In Donna Jackson Nakazawa's new book, "Childhood Disrupted," she breaks down the research on "adverse childhood experiences" and their effect on health outcomes. We'll talk about her findings, as well as the work of Adam Rosenberg, the head of the Baltimore Child Abuse Center, at noon. More information about ACEs can be found here. Catch Donna Jackson Nakazawa at an event on intergenerational trauma at CCBC Dundalk this Friday. On this Veteran's Day Sheilah Kast speaks to Lieutenant Kawika Segundo, a Purple Heart recipient and bone marrow donor. We'll hear about his donation experience and find out why the matching process is so difficult for some patients. If you would like to become a donor, information from the National Marrow Donor Program is available here. “An urban transformation is underway, and smart streets are at the heart of it.” These are the words of Samuel Schwartz, a man who spent two decades as New York City’s traffic commissioner and managed to walk away from the experience an optimist. He’s just written a book titled, “Street Smart: The Rise of Cities and the Fall of Cars,” and he joins us this hour with a look back at how city streets were taken over by cars… and how those streets are beginning to get reclaimed by pedestrians and bicyclists. Also joining us this hour: urban planner and architect Klaus Philipsen, for a look at transportation possibilities and problems here in Maryland. Our state just got a grade of D on its transportation report card and the Central Maryland Transportation Alliance's Brian O'Malley tells us why. Urbanite returns with a special issue on Baltimore's uprising, "Truth, Reconciliation, and Baltimore". Print issues hit the streets today, and the digital version is available here. We'll hear from Tracy Ward, the magazine's publisher; Lionel Foster, a former staff writer and editor of the special issue; and former editor Elizabeth Evitts Dickinson.